If you go camping or to the beach, a cooler is a great convenience. You'll certainly want to keep your drinks cold, even in hot summer temperatures. So you pack some ice in your cooler and throw in some drinks. The size of the cooler will depend on the number of campers and how long you plan to be outdoors. If it's just you and a friend, you might just go with a backpack cooler. But if you're going with a whole group, you'll want a more serious cooler. If you buy a large cooler, it can get pretty heavy when packed with drinks and ice. So it's best that it's on wheels. You’ll see wheeled coolers with a cart that can detach from the cooler. 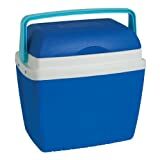 Then there are coolers with a built-in handle, to allow you to pull the cooler around with you. The built-in handle can be either of a constant length or a telescoping handle. With detachable cart: Some coolers ride on a detachable cart. Once you have wheeled the cooler to your campsite, you can detach it from the cart--you’re then free to use the cart for another purpose. With built-in pull handle: These are rectangular coolers with a pull handle and two rear wheels. You can find this with the pull handle on the opposite side from the wheels, or with the wheels on the same side of the handle, but with a telescoping handle. You can pull the handle out when you need to lug around the cooler, and then snap it back it when you put the cooler down. 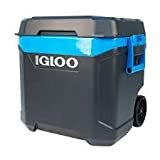 The Igloo Glide Pro has a unique telescopic pull handle that extends the whole length of the cooler, for even greater ease. You can pull it without even having to hunch over. Hard-sided coolers: These are durable coolers, made from hard plastic or even stainless steel. The steel model will be much heavier than the plastic one, however. Also, if the steel model is left in the sun, it will heat up a lot. Hybrid soft-sided coolers: You won't usually find soft-sided coolers on wheels (the soft-sided coolers are usually small enough and light enough to carry, such as the Leopard Outdoor EVA Molded Cooler Bag). But you will find a hybrid version, which has a hard interior and a padded soft exterior with pockets, which is also on wheels. Easy to clean: Since you might use the cooler to keep food cold as well as drinks, you'll want a cooler that is easy to clean. Some of them, unfortunately, don't only keep the cold inside—they also retain odors. So make sure that it's not hard to clean it out afterward. Some even have a removable lining for easier cleaning. 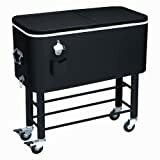 You’ll even find coolers that have an anti-microbial liner, such as the Rubbermaid FG2C0902MODBL Extreme Wheeled Ice Chest. Just in case, it's best to put the food in Ziploc bags or reclosable containers, to reduce the risk of food leaking out. Accessories: Some coolers have speakers and an MP3 player docking station, as well as side pockets for disposable plates and napkins. Durability: Try to look for a cooler with a large, sturdy handle. If the handle breaks, you'll lose the advantage of having the cooler on wheels. Some coolers, such as the Igloo Ice Cube Maxcold Roller have the side handles molded into the plastic of the cooler, which is more sturdy. Pack the cooler densely: The more densely you pack the drinks, and the less air that you leave in the cooler, the longer your drinks will stay cold. Try to pack the cooler as densely as possible. It's best to put the ice in after you put in the drinks so that the ice fills up the vacant spaces left in the cooler. And when the ice starts to melt, don't spill out the water so fast. Water stays cold longer than air does—so leaving the cold water inside will keep the drinks cold for longer. Volume: The size of the cooler will determine how much you can pack inside. There are 16, 38, 50, 75, and 100-quart-size coolers that are available on wheels. A 38-quart cooler can hold 53 12-ounce cans—without ice; 70-quart capacity will translate into 101 cans. One of the largest rolling coolers is the Coleman 120-Quart Coastal Xtreme Series Marine Cooler, which can hold up to 204 12-oz. cans. 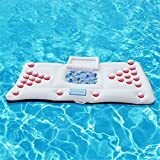 It is also very sturdily built, having a lid that can support as much as 250 pounds--it can be used as a seat, if necessary. Cup holders: The lids of some coolers have compartments to hold cups or a bottle or can of beer. That comes in handy when you put the cooler down in one place and you want to share a few drinks with friends. 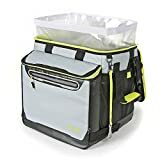 The lid of the Rubbermaid FG2C0902MODBL Extreme Wheeled Ice Chest has receptacles for 6 drinks, while the Leopard Outdoor EVA Molded Cooler Bag also has a food tray in the lid. Draining melted ice: If you pack ice inside your cooler, you will need a way of removing the ice water as the ice melts. Some coolers have a faucet or drain on the side. (The other alternative is tilting the cooler on its side to spill out the melted ice.) Some designs, such as the Igloo 49271 Party Bar Cooler, have a threaded leak-resistant drain plug--you just unscrew the cap to empty out melted ice. You can also hook up the drain to a hose, to use the water for gardening. Built-in bottle opener: If you packed away bottles of beer in your cooler, you may have a problem getting off the bottle cap, depending on where you are. But there are some coolers which have a bottle opener built into the chest of the cooler, as well as a bin for catching the bottle caps. 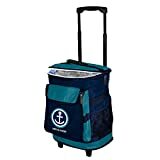 Detachable wheels: In some models, such as the Igloo 49271 Party Bar Cooler, the cooler compartment is on a detachable trolley. This is an added convenience if you come upon rocky or bumpy terrain where wheels are more of a hindrance. Locking wheels: Some also have locking casters on the wheels. This way, you can roll the cooler to your campsite, and then lock the wheels in place. All-terrain wheels: If you’re interested in the quality of the wheels, the Coleman 50-quart Wheeled Cooler has wheels that are 7" in diameter and made from solid plastic. This allows them to go on almost any terrain. Lighting: The Igloo 49271 Party Bar Cooler has an interesting feature: There are LED lights that illuminate the inside of the cooler. This is especially useful if you’re camping out at night, and would like to get a good look at where everything is in the cooler. The lights run on 4 “AA” batteries that you insert. Removable lid: The types of lids on coolers vary: some are on hinges, while others can be removed entirely. The lid on the Goplus Cooler Beer Cart Outdoor Entertaining Rolling Party Steel Bar Bistro consists of two leaves which open separately. 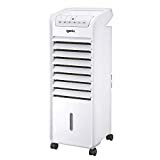 This allows you access from either side of the cooler--that design keeps the cold air inside the cooler: you open the cooler the minimum amount possible to get your food or drinks out. Note: It’s important that you put a little thought into packing the cooler: Put the foods that you’re interested in eating first on top. This will save you the effort of searching for food. Keeping the lid open as little as possible will also prevent hot air from getting into the cooler. Latches: On the other hand, when you are outdoors camping, your cooler might be vulnerable to a raccoon or bear trying to partake of some of your food. There are coolers, such as the K2 Coolers Summit 60, with latches on the lid, so that the cooler can be closed securely to keep out intruders. 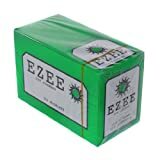 Logo, Inc.--are retailers of a wide range of promotional products. They are located in Vista, California, and market cell phone accessories, office supplies, apparel, and products for the home and travel, and more.